Small business is the largest layer of all modern business. This means that the competition here makes the business owners search new ways of shooting ahead. 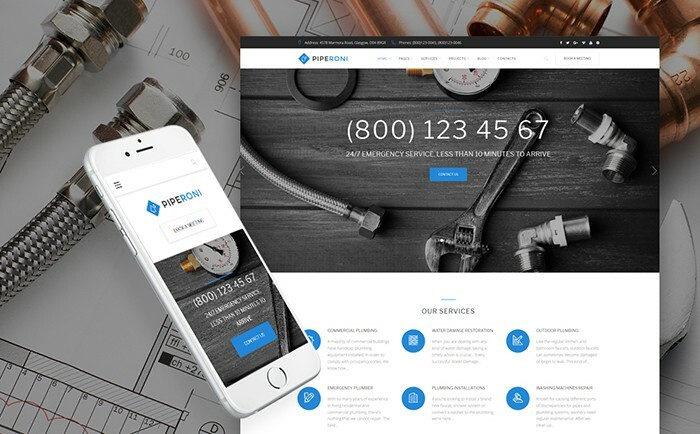 Without a doubt, your website is your main tool in running you business. 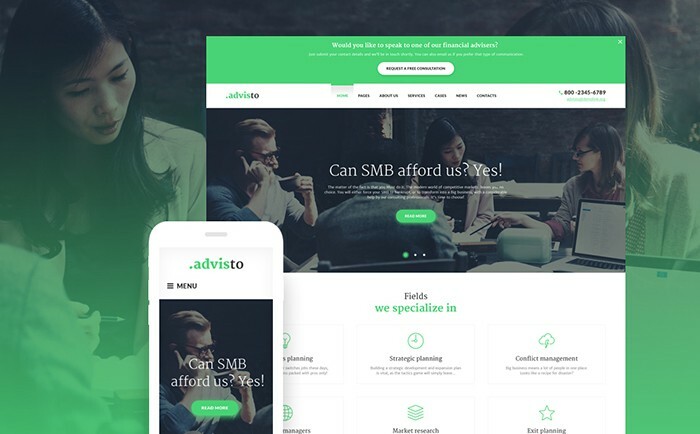 With these small business WordPress themes you will be able to build a professional website that will make you noticeable. So what are the features of a successful business website? When the visitor just landed to your website the first thing he pays attention to is its design. It doesn’t matter, which style you have chosen for your website. But make sure that it looks clean, tidy and all the elements stick together. The next thing you should consider is your website’s functionality. Usually business WordPress themes come pre-packed with lots of features, plugins and widgets. You don’t necessarily need to use them all. Choose those ones that fit your particular business niche. Overburdening your website with lots of unnecessary visual effects, animations and widgets may result in worse performance and losing the prospects. If the theme is not supplied with the plugin you need you can easily install it by yourself. Intuitive interface of WordPress makes it easy even for the beginners. Always provide intuitive and user-friendly navigation. Sticky menu bars, MegaMenu, AJAX-powered elements will help you to create the best browsing experience for your clients. This contributes to higher conversion and results in more sales at the end. 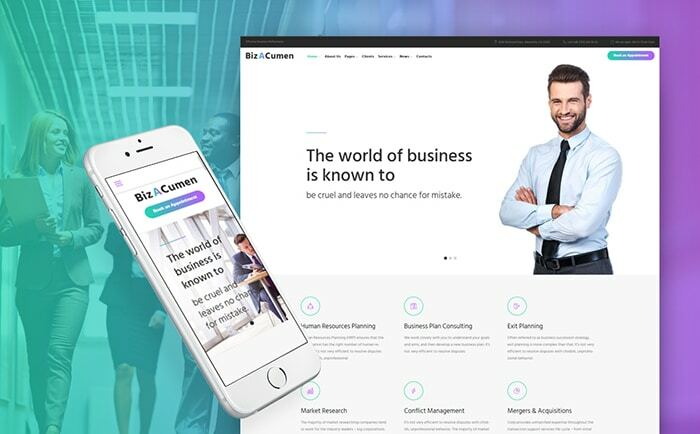 What is peculiar about these 20 small business WordPress themes is that all of them are created by one of the most powerful template providers TemplateMonster. This means 100% satisfaction guarantee. You can be sure in the high quality of coding and design. Although the themes are highly flexible and easily customizable you can apply to TM Service Center and to have everything done for you. If you are just starting your business this video will help you to earn your first money on the Internet. 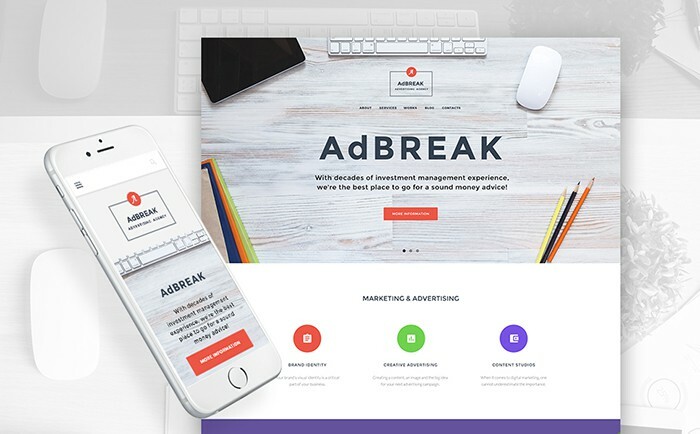 AdBreak is a minimalist WordPress theme with flat elements. Large hero area is a real eye-catcher. TM Power Builder makes the theme really flexible and allows you editing it by simply dragging and dropping its elements. A huge set of custom and premium plugins enhance the functionality of your website and make it look professional. 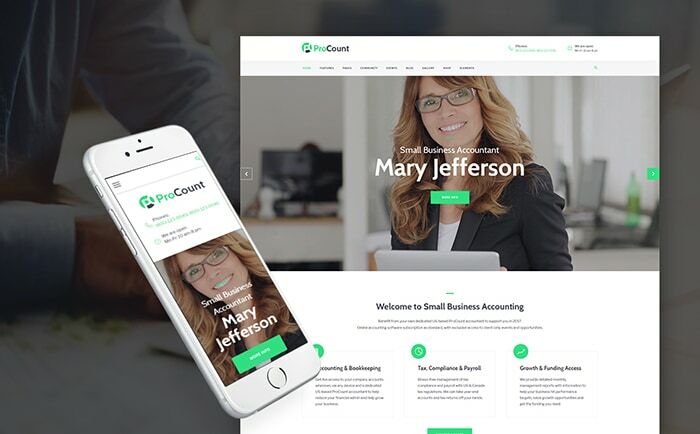 ProCount is a clean template designed in pleasant eye-friendly color scheme. The layout has a clear logical structure. The theme runs on Cherry Framework 5, which provides you with tons of advantages like custom cherry plugins and intuitive admin dashboard. To guarantee seamless displaying on a wide range of devices the theme is fully responsive and retina ready. Magic is a multifunctional solution for a number of different projects. It comes with 7 ready-to-use homepages and 4 different skins. It is easy to adjust the theme to your project due to the Live Customizer and Power Page Builder with drag-and-drop functionality. A huge set of plugins is also included in the package. For example, TM Wizard Plugin makes it possible to install the theme in just one click. The theme uses a simple design with flat elements and nice animation effects. It comes with a huge set of ready-made pages, which make it possible to launch any project without additional efforts. The template provides advanced customization options. You can choose between 7 header and footer styles, multiple layout options and various color schemes. A set of custom widgets enrich your website’s functionality. The template features a clear structure. Blocks with different types of content are visually separated from one another, which make the information on the page readable and digestible. Content Modules allow you diversifying your website’s content with multiple elements. Appointment manager plugin makes it easy for your customers to book an appointment right on your website. 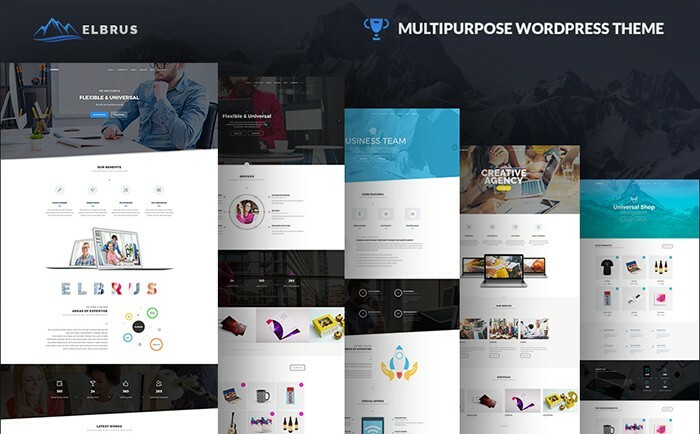 Elbrus is a multipurpose template designed for different types of businesses. The design is fully responsive and retina ready. Slider revolution plugin allows you creating any headers and adding various effects. The theme has an integrated Visual Composer, which gives you full control over your website. The template comes with 5 variants of the homepage and is also Ecwid ready, which makes it easy to integrate an online store into your website. The theme is full of green color, which fully corresponds to its topic. Lots of the white space and pretty fonts make all the information readable and easy to skim. You can use multiple layout options to adjust the theme to your liking and needs. With TM Gallery plugin you will easily find the best way to showcase your latest projects. The theme is ideal for a business coach website. Large hero area allows you to make a positive first impression on your visitors. Timetable plugin allows you creating online schedules and organizing events. Appointment manager plugin provides you clients with an accessible appointment booking. Advanced customization options allow you experimenting with your pages’ structure, fonts, colors and UI elements. 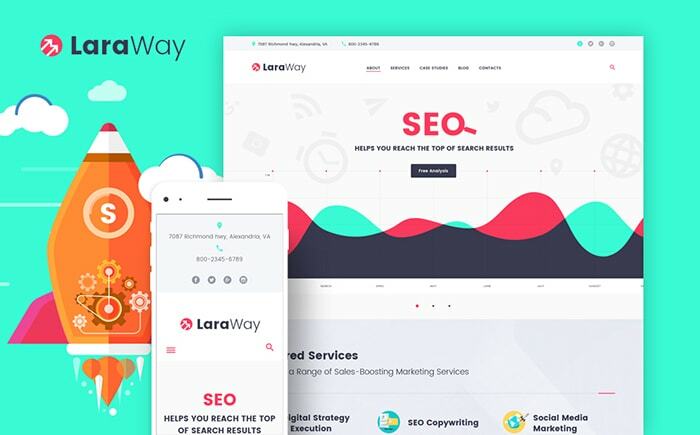 LaraWay is a lovely template that will suit all flat design fans. The simple structure makes it look stylish and up-to-date. There are no heavy design elements that can distract the visitor from the main content. 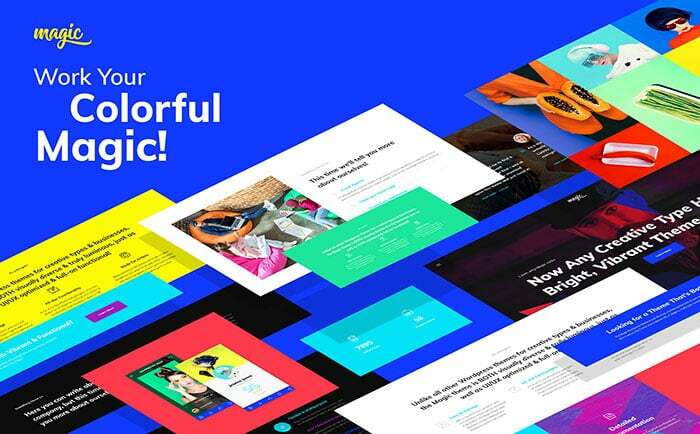 Drag-and-drop Page Builder makes it easy to customize your website in the visual mode. The theme comes with custom Cherry plugins, including Cherry Team Members, Cherry Projects and Cherry Search. 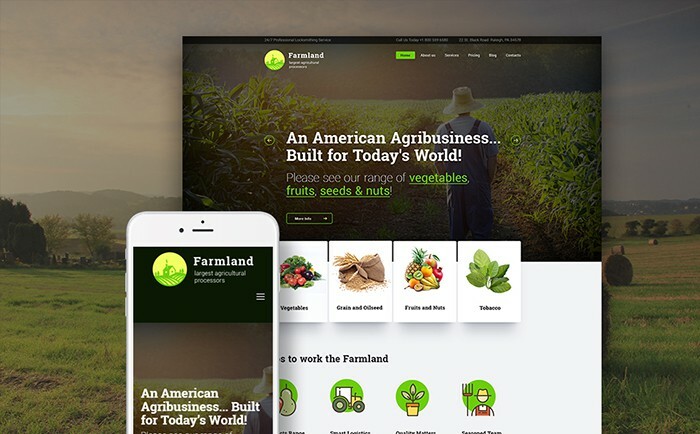 The theme was designed for agriculture and organic farm projects. Flat user-friendly design makes it a real catch for any website. The template is licensed under GPL v3.0, which gives you the right to use it for an unlimited number of projects and edit its source code. Cherry Framework core makes the theme highly flexible and powerful. 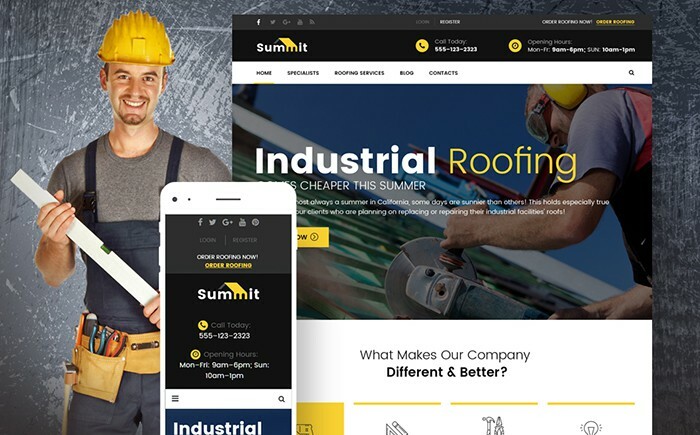 Summit is a good choice for industrial and construction websites. The professional design boasts lots of features that will be useful for those industries. Contrast color scheme makes the template look bright and catchy. Sticky dropdown menu facilitates navigation and search process. The theme is SEO-friendly and fully responsive. 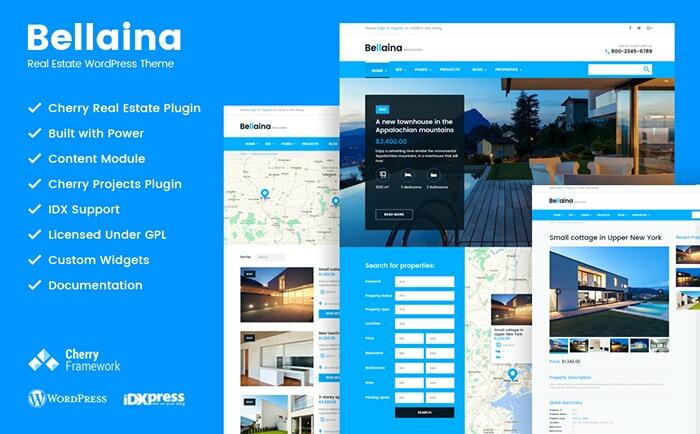 Bellaina is a professional real estate template staffed with the features that will help you to run your business smoother. For example, Cherry Real Estate plugin lets your clients find exactly what they need by providing various filter options, advanced search form and integrated Google map. IDX support makes it easy to embed live real estate data to your website. 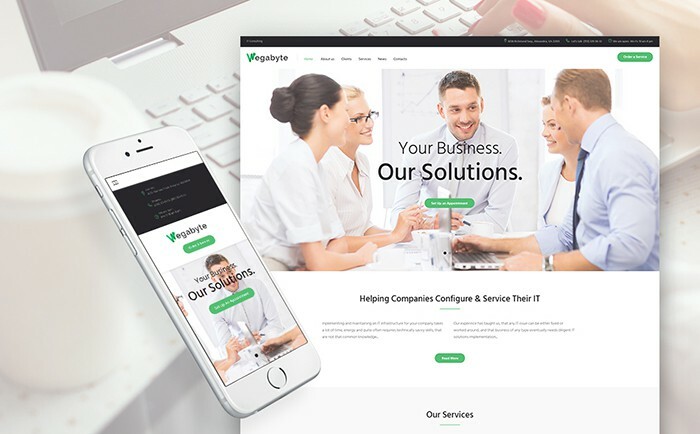 With this theme you will be able to create a solid and professional image of your company. The template features customizable front page, which allows you fully modify its look. You can experiment with the color scheme applying one of the predefined color palettes or create your own using a color picker. There are many handy widgets included into the package like Stock Ticker, Lease Calculator and much more. The template is bright and cheerful, which makes your website noticeable to the others. Being fully responsive and retina ready the theme guarantees flawless performance on various types of screens. There is an integrated Power Builder and Live Customizer to provide you with smooth and effortless customization process. 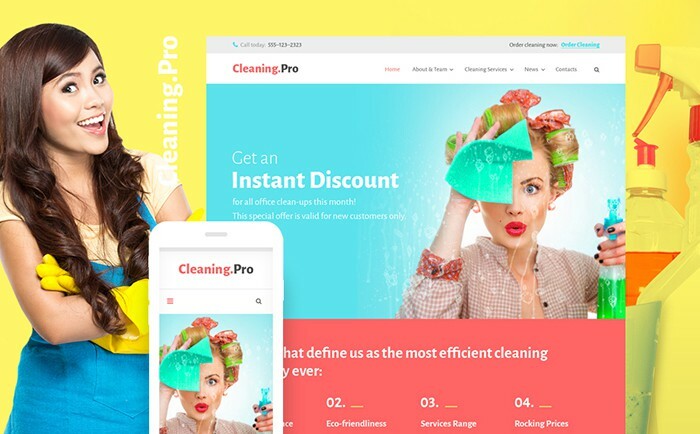 Appointment Manager plugin allows your clients booking your cleaning services online. Using red color in the design is quite tricky. However, in this particular case, it looks appropriate, making the theme look masculine and powerful. The homepage is well-structured. 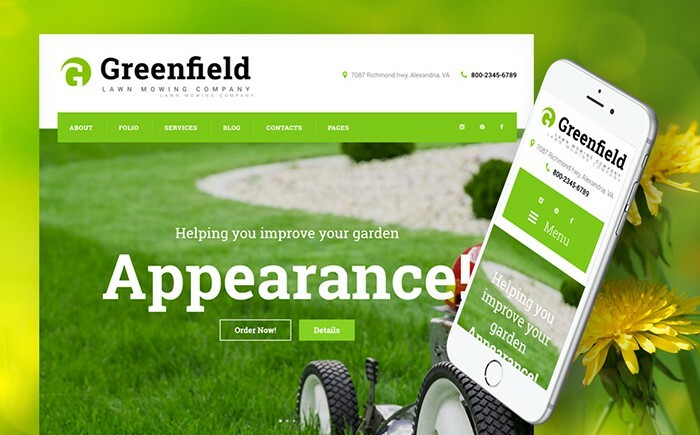 It features lots of attention grabbers, integrated forms, and testimonial section. Full social integration will be useful for creating social presence of your brand. The design, structure and functionality of this template perfectly combine to create a professional and trustworthy image of your company. Rich UI kit allows you adding multiple elements to engage different types of visitors. The customization is as easy as drag-and-drop thanks to the Live Customizer and Power Page Builder. 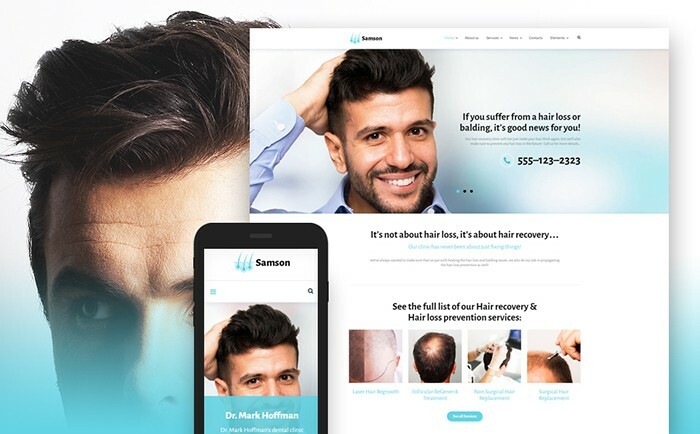 This clean and stylish template is an ideal solution for a medical website. The well-thought design allows you presenting your services and evoke the trust in your prospects. The template is pre-packed with everything you might need: Power Builder for customization, content modules for diversifying your website’s content, Appointment Manager plugin and lots of other plugins to enrich the functionality. With this powerful template you will launch your website without any efforts. It is equipped with a setup wizard that will help you to install your theme, plugins and sample data in few clicks. Running on Cherry Framework WegaByte is equipped with lots of custom Cherry plugins, which makes the theme flexible and user-friendly. 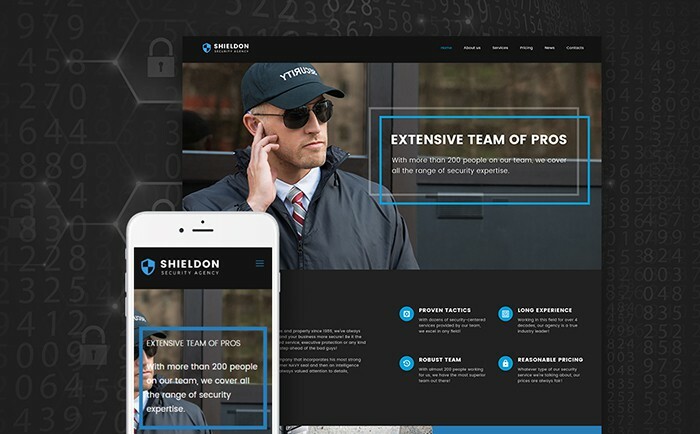 The template looks professional and strong, which is ideal for a security website. The design is fully responsive and retina ready, guaranteeing flawless performance through a number of devices. 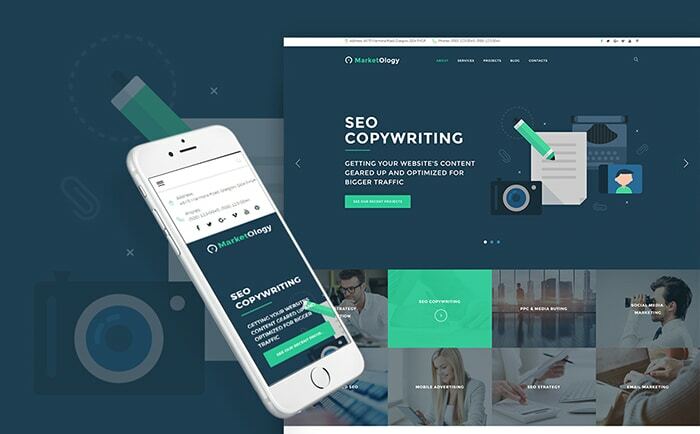 The theme is highly flexible, optimized for performance and SEO. You can make use of parallax effect to add dynamics to your layout and to engage the visitors. The template features robust structure. The layout looks simple, but is highly functional. You can modify it up to your liking thanks to Power Page Builder. The template comes pre-packed with a number of premium and custom plugins, including professional Cherry plugins. 25 content modules make it easy to insert various types of content to your pages. Wow! what an amazing list of WordPress Themes! I really like the one called Magic. But it is hard to pick just one favorite from this awesome list. I think WordPress Themes are evolving fast now and there are many things you can do with them. Many new developers are getting very creative with the designs and functionalities. I’m definitely bookmarking this post! There’s so much you can do with WordPress, I just love it. Thank you for sharing this WordPress Themes. They all look awesome and I agree I can’t pick which one could be perfect fit. Anyways, thank you for sharing this. I will be saving this to my bookmarks. And can’t wait to read more of your works. Glad you enjoyed this list from MonsterTemplates. I think now-a-days all business should have their own website to grow its productivity. I agree with you that websites is a main tool to running business. Designing is the first impression of any websites and it should be look clean and tidy. Here you listed huge collection of lovely wordpress themes for small business. Thanks for visiting and sharing your views here, Praveeen! All of the WordPress themes are awesome and it’s really become difficult for me to choose one. But according to some features, i would go for Laraway theme. I hope results will be good. Thanks for checking the post, Lasith. 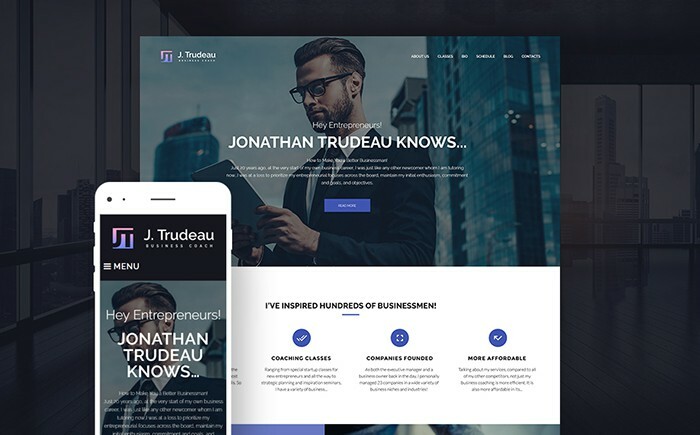 Many beautiful business themes here, from TemplateMonster. Nice post, Erik. Thanks for the share. I believe word press is the best content management site out there and a nice specific theme is excellent to start with. Your discussed themes too are really helpful if someone is starting out. Farmland is great for agriculture industry and Summit for roofing industry. Glad that there’s some theme for everyone. Thanks for stopping by and sharing your views, Rajkumar. Magic and Laraway are my favorite themes from the above list. They both look great, responsive, and are best suited for small business owners needs. Thanks, Erik, for sharing this amazing list. Nice share. 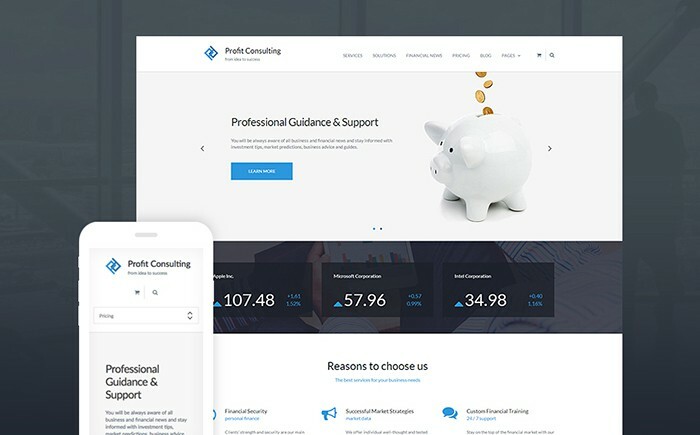 I am using procount theme for one of my client. Got to know about some amazing business theme from this post. Will buy some of these themes for clients. Thanks for the positive comment, Kuldeep. All the themes you listed were most suitable for specific field and some are for multi purpose as well. From the list Elbrus is the most wonderful theme I loved. That’s a nice one, Durga. Thanks for sharing this awesome list of popular Startup themes. Glad you liked the post, Punit. I have tried Laraway theme; it’s a good one! I’m using it on one of my niche sites, highly customizable! Thanks for sharing your experience with TemplateMonster themes, Nikhil. Thanks Erik for your valuable info. A quality WordPress theme choosing needs to require some serious brainstorming to determine the best outcome. I was simply stumped on choosing the theme for my locksmith blog.Even tried different theme creator platform but I failed. I found your article more interesting and useful as a tool which could help me explore my blogging experiences in this sector and help to get the creative juices flowing. Thanks for adding your comment here, Roger. You shared really beautiful themes. 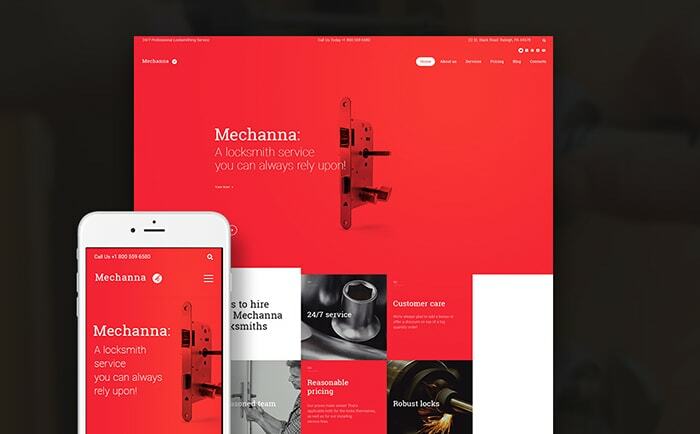 I also want to share one best business related WordPress themes called Kosmic. It is very simple, clean and responsive WooCommerce supported theme suitable for almost all types of websites.